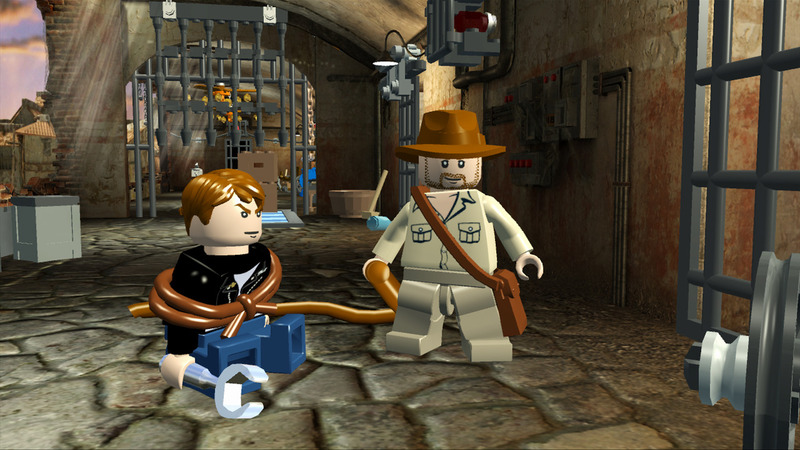 This exciting, family-friendly game follows Indy's adventures in the most recent film, Indiana Jones and the Kingdom of the Crystal Skull, but also includes scenes from the first three movies that weren't covered in the first LEGO Indy game. The main focus is still on exploration, treasure hunting and artifact collecting—with a little light combat, LEGO style. 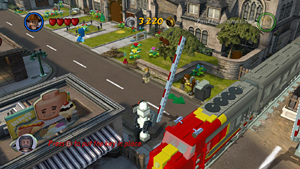 Players can still adventure alone or with a buddy, but rather than taking a linear path through each story, the game has "hubs" based on the various films. There's also a Creator hub where gamers can customize characters and create their own playable levels. My detailed visual walkthrough is designed for players of all ages. Advanced players can follow the text. Beginning readers will find dozens of helpful screenshots for each level. I encourage parents and older siblings to play co-op with younger kids and enjoy Indy's adventures together. For additional details, including more game features and PC system specifications, please visit the official LucasArts site. *The PSP and Nintendo DS versions differ from the "big" game and are not covered on this site yet. (Check the PSP/DS page for a good walkthrough link.) The portable game focuses entirely on the Crystal Skull storyline and does not include the Level Builder. 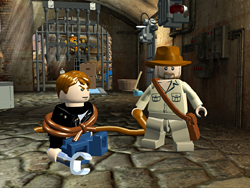 LEGO Indiana Jones 2 is built around seven hubs, known in the LEGO world as playsets. Only one playset, Kingdom of the Crystal Skull Part 1, is accessible at the start. You'll unlock the others as you progress. Playsets that are still locked appear as plain wooden crates in the main menu. For details on navigating the Playset Menus, see the Controls and Menus page. Each hub or playset has a large, open area to explore. Here you'll find the entrances to all the levels in that chapter, as well as plenty of hidden goodies and mini-games. The Creator playset includes tools to make your own Indiana Jones adventures. It is covered in a separate section. There are four types of levels in each playset: Story, Treasure, Bonus and Super Bonus. Each type presents different challenges and rewards. STORY LEVELS – There are 5 Story Levels in each playset. Each has a physical entrance—such as a door, a cave opening, etc.—in the hub map. The entrance to the next unplayed Story Level is almost always marked by a big green arrow. If you're having trouble figuring out where to go, check the hub maps and/or walkthroughs. TREASURE LEVELS – Each playset also has 5 Treasure Levels. Completing a Story Level unlocks the corresponding Treasure Level. They usually share the same location on the hub map, but Treasure Level entrances are marked with gold arrows. Most Treasure Levels require characters with special skills or equipment, which you may not have right away. If you enter a Treasure Level and see a message on screen telling you that different characters are needed, just exit and return later with those characters once you've unlocked them. The ultimate goal of each Treasure Level is to obtain a golden treasure chest, which are called Artifacts in the game. Collecting all of these Artifacts, plus the ones in the Bonus Levels, unlocks the Super Bonus Level in each hub. BONUS LEVELS – Each playset also includes 5 Bonus Levels. The entrances are usually hidden or reachable only by characters with certain abilities. Once inside a Bonus Level, however, you'll automatically control the characters needed to complete it. Bonus Levels are set up like obstacle courses with a series of puzzles, traps and challenges, and an Artifact as the reward at the end. SUPER BONUS LEVELS – There is only one Super Bonus Level in each playset. To enter you must first find all 10 Artifacts in that hub, by completing the 5 Treasure and 5 Bonus Levels. 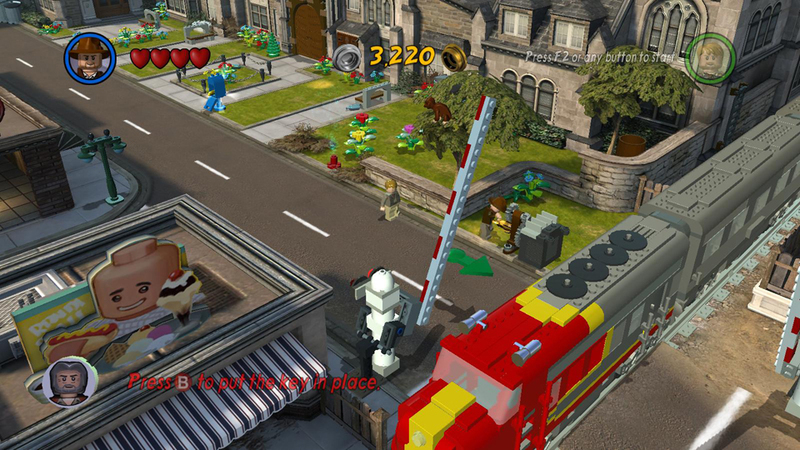 Inside, a Super Bonus Level looks like giant LEGO playset, with roads, houses, trees, vehicles and more. The goal is to speed around smashing everything in sight until you've collected 1 million studs. There's no time limit, but you can compete against your friends or try to beat your own previous record. When you finish and return to the hub map, you can use the studs you've earned to purchase Characters, Vehicles and Extras. To replay a Bonus Level, either enter it again from the hub map or select it in the Playset Menu. After you've completed one Super Bonus Level, you'll unlock the Super Bonus Level playset in the main menu. You'll then be able to replay any completed Super Bonus Level through the playset or by re-entering it on the hub map. When you've unlocked the Creator playset, you can also use the Quick Play feature there to replay any level. 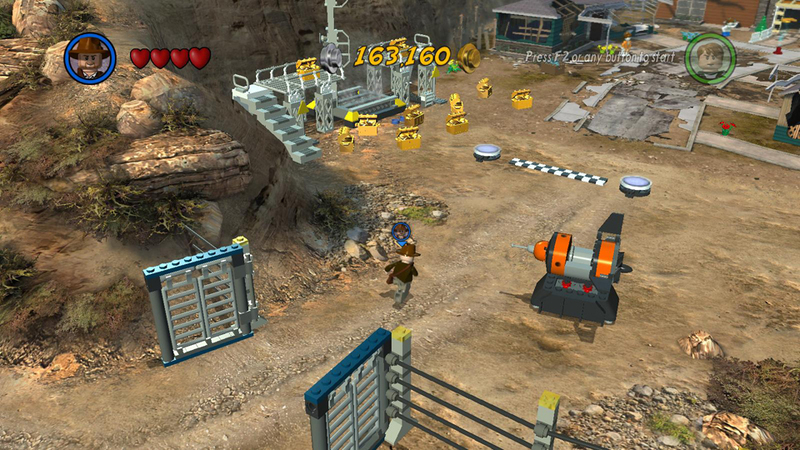 What would a LEGO game be without goodies to collect? LEGO Indiana Jones 2 includes some of the same items as the previous game, plus some new ones. All are described below. To check your progress, just press Pause/Escape. This brings up the pause menu and displays the important items you've found so far. 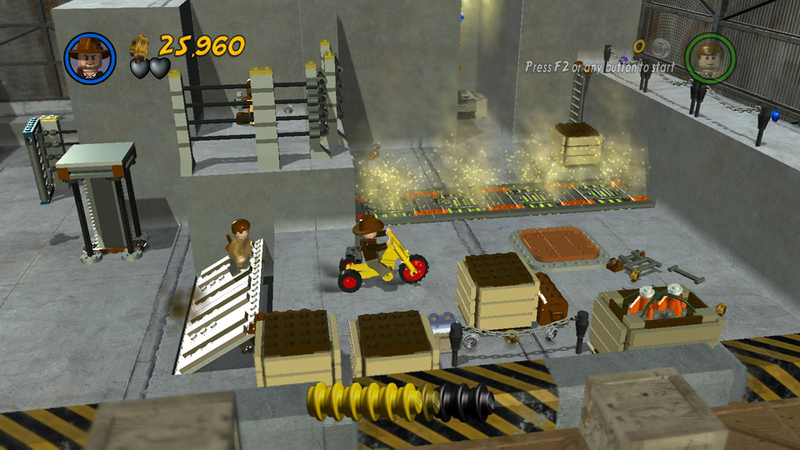 STUDS – Most objects in the game world release studs when smashed. The counters at the top left corner of the screen shows how many studs you've collected so far in the current level. In a co-op game, the stud counter for Player 2 is at the top right. When exploring the hub maps, the counter shows the total number of studs you've collected in the game. There are various types of LEGO Studs, each with a different value: Silver: 10, Gold: 100, Blue: 1,000 and Purple: 10,000. Purple studs are more common in LEGO Indiana Jones 2 than in the first game, so I haven't noted the locations of every single one in the walkthrough. I do mention the purple studs that may be more difficult to find. 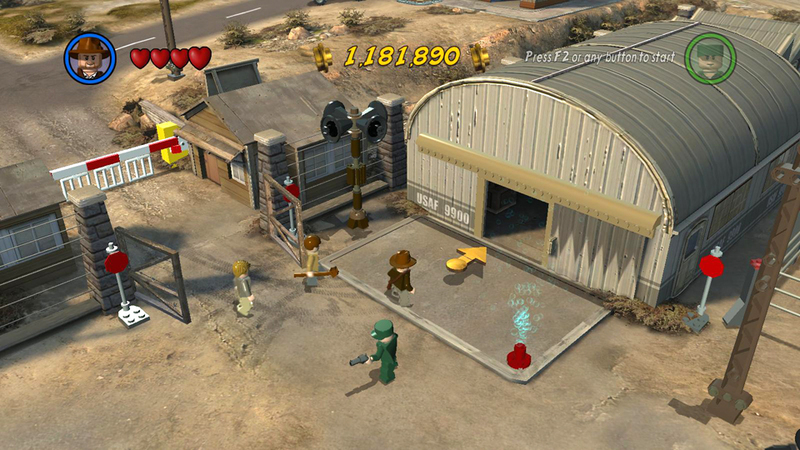 Studs are used to purchase new Characters, Vehicles and Extras. Smash everything in sight. Most LEGO objects can be destroyed to release studs. Each time your character dies, you lose a few studs. In single-player mode, you can sometimes avoid this by quickly pressing Free Tag to switch to the other character before the first character shatters. "True Adventurer" status can be achieved in each level by collecting a certain number of studs. The exact number varies for each level and is included in the walkthrough. The yellow stud meter at the bottom of the screen shows your progress. Once you've collected enough studs and filled that meter, the words "True Adventurer" flash across the screen. The meter then remains full even if you subsequently lose some studs. Getting True Adventurer for all levels is one factor in achieving 100% completion. HEARTS – Some objects and enemies release hearts when they are destroyed. Hearts restore your character's health when you pick them up. ARTIFACTS – Each time you complete a Treasure or Bonus Level, you earn an Artifact. These Artifacts are collected in a special location on the hub map. When you've obtained all 10 Artifacts in that hub, you can smash them and use the pieces to build a huge model, which then becomes the entrance to the Super Bonus Level. COLORED BRICKS – Each hub map includes 30 hidden LEGO bricks—10 red, 10 green and 10 blue. When you've located all of the bricks of one color, a package drops from the sky. These packages contain various Extras—things like special abilities and treasure multipliers—which you can purchase using the studs you've collected. For details, see the hub walkthroughs and the Extras page. CHARACTERS & VEHICLES – You start each hub with just a few characters and no vehicles but unlock more as you progress. Once you locate a new character or vehicle, you must use the studs you've earned to purchase them before they can be used. See the Characters and Vehicles pages for details. Indy can use his whip as a lasso.WEAPONS - In addition to Indy's trusty whip you'll also control characters with other weapons. Occasionally you'll be able to pick up weapons dropped by defeated enemies. These include spears, swords, pistols, machine guns, grenades and even bazookas. When an enemy drops his weapon, you'll need to move fast to pick it up before it disappears. Borrowed weapons last for just a limited time. Once they've been thrown or run out of ammo, they disappear. 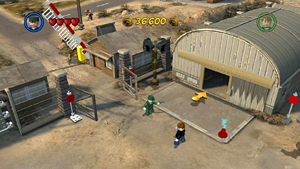 In LEGO Indiana Jones 2, characters can carry more than one object at a time, although this is limited to each character's default tool or weapon and two additional items. Picking up a fourth object will cause the character to drop one of the items he's carrying. To switch between fists, weapon and any other object a character may be holding, tap the Use button. If you need to carry additional objects, have the second playable character do it. Fists/Tools – Every character has some kind of basic attack. Usually it's hand-to-hand combat but some characters have tools, such as shovels or wrenches, that they use as weapons. To attack with fists or tools, just stand close to the enemy or object you want to hit and press the Attack button. Whip – Indy can use his fists or whip. When Indy is close to an enemy, press the Attack button to punch. To use the whip, stand a little distance away from the enemy and press Attack. Or, hold the Attack button to bring up the targeting reticule. Use the control stick or direction keys to center the reticule on a particular enemy. Then release the Attack button to make Indy tie up his foe. You can then hit the immobilized enemy or drag him along the ground. Or, move in close and press Use to pick him up and Use again to drop him where you want him. Sword/Spear – These weapons can be used in close combat, by pressing the Attack button, or as projectiles. To throw a spear or sword at a distant target, such as a rope that needs to be cut, face the target and hold the Attack button until the targeting reticule appears. Aim with control stick or direction keys and release the Attack button to throw. Gun/Crossbow – Face the target and press the Attack button to shoot. Or, if there is a particular object that can be targeted, face it, hold the Attack button until the targeting reticule appears, aim and then release Attack to fire. Grenade/Bazooka/Rocket Launcher – Aiming works the same as for other weapons; however, grenades, bazookas and rockets are powerful enough to destroy multiple enemies or blow up shiny, metal objects found in some areas. TOOLS, KEYS & MISCELLANEOUS ITEMS - Some characters have abilities that allow them to do specialized tasks, but even characters without special abilities can sometimes do these things if they have the right tools. The list below tells what various tools and objects do. See the Characters page for more info on Special Abilities. Whip – Indy's weapon can also be used to grapple and pull certain objects and to swing across gaps. These actions are covered by in-game tutorials and in the walkthrough for the 1st Story Level, Hangar Havoc. Shovel, Wrench & Book – These objects allow characters to dig, repair machinery and translate ancient hieroglyphs, respectively. These skills are covered in detail on the Characters page. Key – Golden keys are used to operate crank mechanisms that open doors, raise bridges, etc. Keys are usually well hidden. So if you find a mechanism that doesn't work, try looking for a key. Torch – No character comes equipped with a torch. So if you need one, you'll always find it somewhere nearby. Torches are used to light dynamite fuses, set flammable objects on fire and repel pests like snakes. Banana – You'll only find bananas in a few areas, but they can be very useful. When you encounter a monkey, look for bananas nearby. Grab one and throw it to the monkey (aim as you would with a weapon, above) and the monkey will often give you something you need, such as a key or tool. Brick Piles – When you see a jiggling pile of LEGO bricks, stand close and hold the Use button to build. The finished object is usually something you can use or add to an existing structure. Or it may be something you need to break to get its contents. Parts, Pads & Panels – Whenever you see a flat, green LEGO plate or panel, you'll need to find another LEGO object to place there. Vehicles – The game includes numerous vehicles. Some must be purchased with studs before you can drive them. To use a working vehicle, hop in (by standing close and pressing Free Tag). Then just steer with the direction keys or left stick. Press Use to back up. The Vehicles page includes specifics, and you'll find more info in the Vehicles section of each hub walkthrough. Animals – A few LEGO animals (elephants, horses, etc.) can be ridden. Get on by standing close and pressing Free Tag. Steer with direction keys or stick. Complete all 5 Story, 5 Treasure and 5 Bonus Levels in each of the 6 main playsets. Unlock and complete the Super Bonus Level for each playset (6 in all). Earn True Adventurer status on all levels. Find all red, green and blue bricks. Complete the Creator playset to 100%.